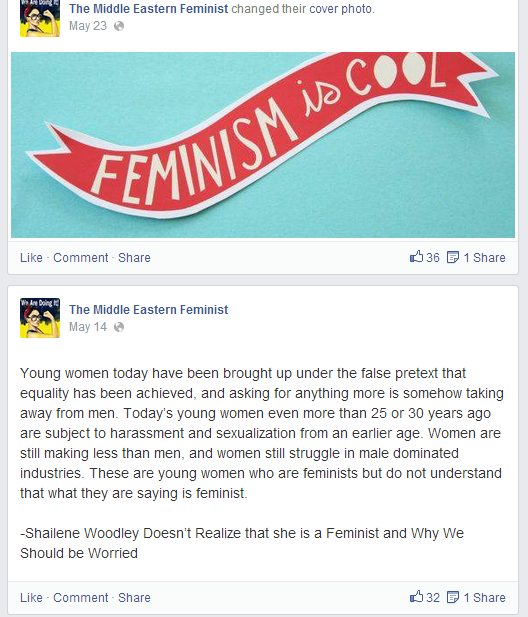 The Middle Eastern Feminist page singled itself out from other feminist pages on Facebook when it started up in December last year. Feminism across boundaries of ethnicity and nations; love over hate; support over anger, seemed to be the red threads for the page. “If you are struggling today, remember that you were never meant to be ashamed, depressed and guilty. You were always meant to be victorious! Don’t let the bastards grind you down,” says a quote followed by a heart from July 16. The reconciling approach seemed to appeal to many. The page soon had many followers. Often white, middle class women are blamed for having this approach to women’s rights as they haven’t faced real hardships themselves. But the woman behind The Middle Eastern Feminist page is not one of those. Hawzhin Azeez’s early childhood memories consists of escaping Iraqi Kurdistan as Saddam Hussein bombed the area with chemical weapons; her pressing a scarf against her face not to breath in the lethal smoke; her mother having skin burns all over her. Living as illegal refugees in Iran the family sometimes didn’t eat for days, and on a regular basis the police came and took away her father, accusing him of being a part of the resistance against the Iranian regime due to his Kurdish ethnicity. The family never knew when or if he was coming back. In this setting there was no room for women’s rights. After finally receiving asylum in Australia, Hawzhin and her family faced a new dilemma: the one of suddenly being in a liberal culture with new gender roles that they had no idea how to manage. In the Kurdish community where they lived a strong social control was being exercised. Hawzhin points out that it was first and foremost the women who exercised this control over each other and each other’s daughters. She says they had internalized the racism and sexism they had been exposed to as Kurds in the Middle East, and turned it into misogyny. Despite the lack of role models, Hawzhin knew she was a feminist. As a teenager she was incredibly angry because she wasn’t able to live her life the way she wanted to. She read a lot of feminist literature in high school, it was her escape. Despite having arrived to Australia as an 11 year old with only two years of primary school education, Hawzhin was able to enter university after high school to study international relations and political science. But even having made it so far, she couldn’t live the way she wanted to. When she moved out of her parents’ house to do her PhD in another city at 25 years old, she was finally able to be independent. But it took a long time for her to adjust. When starting The Middle Eastern feminist page it was after a long and difficult semester at university, when she was emotionally drained and spent a lot of time in front of Facebook. She noticed how people mostly posted things about what they ate and going to the gym, and wanted to turn her Facebook time into something more intellectual. Her motivation also steamed from being back in her country of origin for the first time since the escape. She went on her own without her parents and met up with her relatives. The trips were wonderful, she says, but she noticed how little women in Iraqi Kurdistan knew about their rights, and this was something she wanted to change. Hawzhin mean that some women in the Middle East might not be able to escape their traditional life but that they can find space where they can still be feminists. 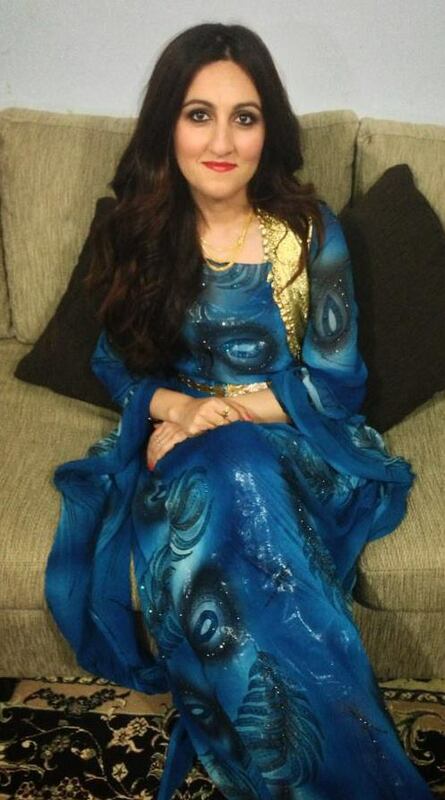 Another goal was to educate Western women on Middle Eastern women’s issues. She wanted a place for women from the two worlds to meet and realize that they were dealing with the same issues. The page is now an active place for discussions and many of the over 6.000 followers are not only from the Middle East but from all over the world. Through the page connections are being made and people are making friends across boundaries. Hawzhin is actively promoting other feminist pages on her own, urging her followers to like a new page that has recently been started. She’s also sharing her private Facebook page with followers that want to add her as a friend – a page where she has posted photos of herself and her mom hugging, dressed up in Kurdish clothes, as well as photos from university parties where she’s dolled up (“I dress very femininely, I love to wear lipstick,” she says on a side note). On combining the different cultures, she says that she sees herself as a bridge between women in Afghanistan who can’t leave the house, and urban, developed women in Egypt; that they can contribute to each other through the page. Hawzhin has had very little negative feedback on her page and says she is shocked by the amount of support and number of women that have been contacting her. Some people expect that she’s a Muslim feminist but this is not what she calls herself. So how are her parents, the once traumatized refugees that had such a hard time to adjust to the new society they were in, dealing with their daughter having developed to being such an outspoken feminist? Reblogged this on Alina Javed Siddiqui. I’ll let her know, Barbara! Incredible story! Thank you JC.